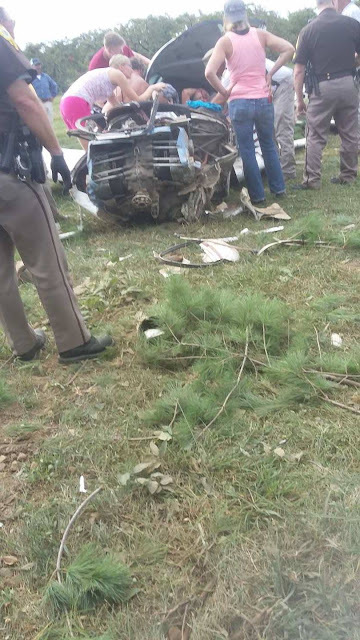 On August 28, 2017, at 0906 central daylight time, a Gulfstream American Corporation AA-5B airplane, N28005, experienced a propeller separation in cruise flight and impacted trees and terrain during a forced landing near Carbondale, Illinois. The pilot and passenger sustained serious injuries, and the airplane sustained substantial damage. The airplane was registered to and operated by a private individual under the provisions of 14 Code of Federal Regulations Part 91 as a personal flight. Visual meteorological conditions prevailed at the time of the accident, and the pilot was receiving visual flight rules flight following. The flight departed Louisville, Kentucky, at 0815 eastern daylight time, and was destined for Oklahoma City, Oklahoma. The pilot reported that about 1 1/2 hours after departure and about 6,700 ft mean sea level, he felt a "jolt" in the airplane as if the airplane struck an unknown object. The pilot realized the airplane propeller was missing, and the engine began to overspeed at a high RPM. The pilot reported an engine failure to air traffic control, initiated an emergency descent, and attempted to land at the Southern Illinois Airport (MDH), Carbondale, Illinois. The pilot was unable to glide the airplane to MDH and executed a forced landing to a field near Carbondale. During the forced landing, the airplane impacted trees and terrain, and came to rest upright. 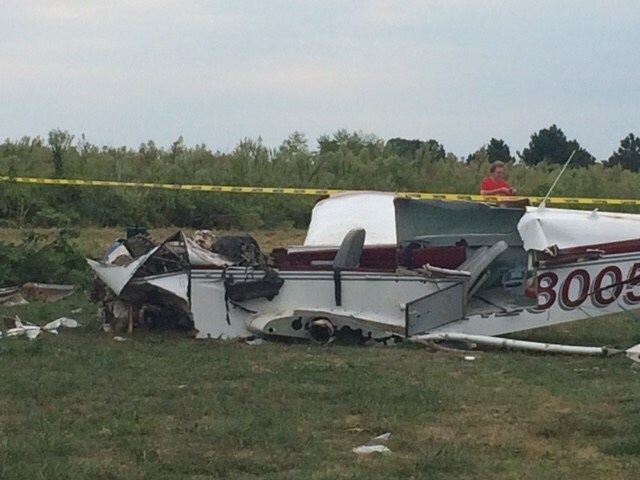 The airplane sustained substantial damage to both wings and fuselage. The propeller, spinner, and spinner bulkhead were missing from the airplane wreckage. Residential homeowners, located about 9 miles south of the accident site, found separated sections of an airplane propeller in their yards. The separated sections of the fixed-pitch propeller included both blades, the propeller hub, and other propeller installation components. The propeller sections were recovered by law enforcement and the Federal Aviation Administration. A review of the airplane records revealed the separated propeller sections matched the propeller model that was installed on the accident airplane. The most recent annual inspection was completed on January 25, 2017, at a tachometer time of 1,472.96. The tachometer time at the accident site was 1,506.71. The McCauley model 1A170/FFA propeller was subject to repetitive inspections in accordance with Airworthiness Directive (AD) 82-27-01. The inspections are to be accomplished at intervals of 200 hours time in service (TIS). The inspections include removal of paint from the hub area followed by dye penetrant inspection of the attachment holes, center bore, and entire hub area. The last inspection per the AD was completed on March 20, 2015, at a tachometer time of 1,429.35 hours. According to the mechanic that performed the last recorded inspection, the shop did not use red dye penetrant, and inspections are performed with a fluorescent dye penetrant for higher sensitivity and easier clean-up. The propeller with attached doubler, forward bulkhead, spacer, and attachment bolt pieces (propeller flange lugs) was examined by the NTSB Materials Laboratory. The propeller was fractured through the hub area with fractures adjacent to and partially intersecting bolt holes. Both fractures were on a relatively flat fracture planes with curving crack arrest marks, consistent with fatigue. The fatigue features on each fracture surface emanated from multiple origins located at the forward face. Fretting contact damage was observed near many of the attachment holes. Pink and red deposits were observed in the attachment and dowel holes for the propeller. No pink or red deposits were observed on the surfaces of the holes in the spacer. The fatigue fracture region extended across most of the fracture surface. Near the origin, a portion of the fracture surface had a brown color, and an adjacent region with bluish gray tint. A periodic pattern of 17 crack arrest lines was observed between the bluish gray region and the fatigue boundary. No evidence of fluorescent dye was observed on the fracture surface. Fracture features in the spacer at the forward ends of a bolt hole and a dowel hole had a faceted appearance with the fracture on a plane perpendicular to the forward face, and features consistent with fatigue in the aluminum alloy. Fatigue features emanated from the hole corners at each location. Portions of the doubler fracture surfaces had flat fractures perpendicular to the surface with curving boundaries, features consistent with fatigue. The fatigue features were located at the edges of the attachment bolt contact faces. The fatigue propagated through the thickness of the doubler, initiating at the forward face in the fractures near 2 holes and initiated at the aft face near one hole. The thickness of the doubler was measured in a flat area between the holes. The annular regions around the holes corresponding to the head contact area were recessed relative to the adjacent surfaces, and the surfaces were smeared in the circumferential direction consistent with sliding contact with the underside of the attachment bolt heads. The forward bulkhead was fractured circumferentially outboard of the propeller attachment holes. Pieces were missing including the entire outer circumference and segments between 4 holes. Portions of the fracture surfaces had flat fractures perpendicular to the surface with curving boundaries, features consistent with fatigue. Fatigue regions were present outboard of each of the propeller attachment holes. The origins were located adjacent to the annular area associated with the attachment bolt heads, initiating at both the forward and aft sides of the bulkhead at each of the locations. The remaining fatigue regions had fracture features that generally propagated radially inboard or outboard and were located between attachment holes that corresponded to the propeller fracture locations. Around each of the attachment holes, the forward bulkhead was deformed and was slightly dished with the concave side facing toward the forward direction. Black deposits with silver flakes were observed in the threads and around the inner circumference of the lugs forward of the threads. A sample of the deposits were analyzed. The spectrum was consistent with carboxylic acid. A spectral library search was performed on the obtained material spectrum, and no strong matches were identified. However, there were some similarities to the spectra of several surfactants. Carboxylic acids are used in the production of several classes of surfactants. Carboxylic acids, as well as surfactants, can be found as components or additives to lubricants, greases, and fuels. According to the McCauley Propeller Systems Owner/Operator Information Manual, the torque specifications for propeller attachment bolts on fixed pitch propellers are for bolts installed dry. The use of visible dye penetrants (Type II) is not recommended for the inspection of the propeller and propeller hardware. While Type II visible dye penetrants do have limited crack detection capability, the constituents of visible dye penetrants are likely to deposit residue in crack voids. The residue can be extremely difficult to remove from cracks, regardless of the cleaning method employed. Cracks can become fully or partially masked by the remaining residue. Due to these characteristics, visible dye penetrants can make follow-on detection of existing cracks virtually impossible when using other NDI penetrant methods, specifically Fluorescent Penetrant Inspection (FPI). The McCauley Propeller Systems Owner/Operator Information Manual also indicates fixed pitch propellers such as the accident model should be overhauled after 2,000 hour TIS or 72 calendar months, whichever occurs first (the time limits for overhaul listed in the owner's manual are not a requirement for airplanes such as the accident airplane operated under 14 Code of Federal Regulations Part 91). The overhaul process includes removal and reapplication of paint to the propeller to facilitate dimensional and FPI inspections. According to a representative from McCauley Propeller Systems, the design logos on the accident propeller were discontinued from use at McCauley in 1998. According to the flight log data provided by the pilot, the airplane accumulated 28 flight cycles and 89.9 hours TIS since the last propeller inspection per AD 82-27-01. No flight cycles were accumulated for more than 100 calendar days on several occasions. 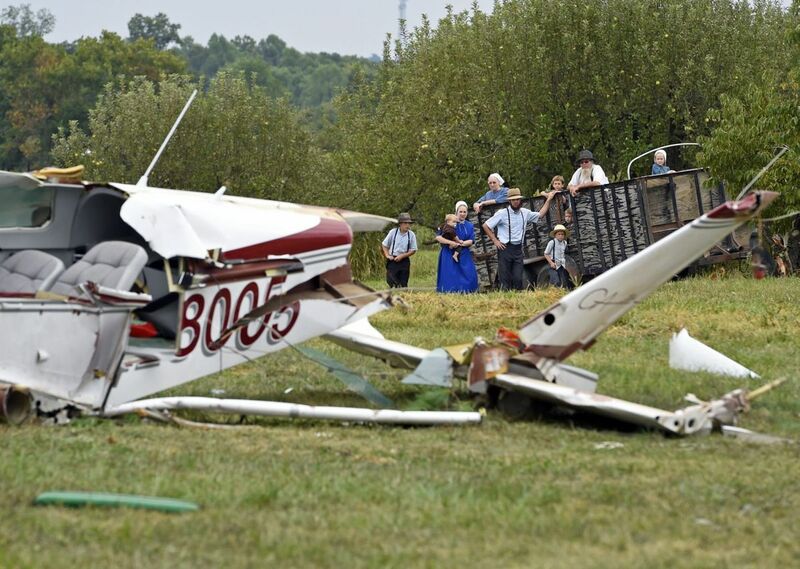 On August 28, 2017, at 0906 central daylight time, a Gulfstream American Corporation AA-5B airplane, N28005, experienced an in-flight propeller separation in cruise flight and impacted trees and terrain during a forced landing near Carbondale, Illinois. 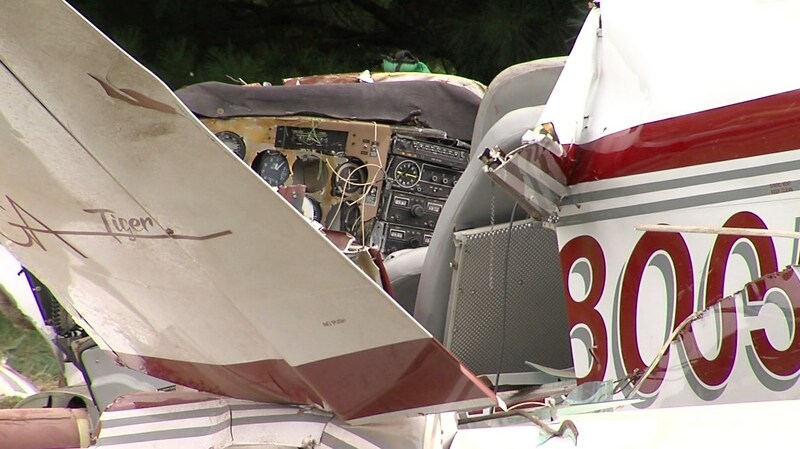 The pilot and passenger sustained serious injuries, and the airplane sustained substantial damage. The airplane was privately owned and operated under the provisions of 14 Code of Federal Regulations Part 91. Visual meteorological conditions prevailed at the time of the accident, and a visual flight rules flight following flight plan was filed. The flight departed Louisville, Kentucky, at an unknown time, and was destined for Oklahoma City, Oklahoma. According to the Federal Aviation Administration inspector who responded to the accident site, the airplane was in cruise flight when the pilot reported an engine failure to air traffic control. The pilot initiated an emergency descent and attempted to land at the Southern Illinois Airport (MDH), Carbondale, Illinois. The pilot was unable to land at MDH and executed a forced landing to a field near Carbondale. During the forced landing, the airplane impacted trees and terrain, and came to rest upright. The airplane sustained substantial damage to both wings and fuselage. The propeller, spinner, and spinner bulkhead were missing from the airplane wreckage. A home owner, located about 9 miles south of the accident site, found a separated section of an airplane propeller in the residence's yard. The separated section of the fixed-pitch propeller included one blade and about 1/2 of the propeller hub. The propeller section was recovered by law enforcement and returned to the accident site. A review of the airplane records, which were located in the airplane, revealed the separated propeller section matched the propeller model installed on the accident airplane. The airplane and propeller section were recovered for further examination.